Eagle Eye | First Edition 1E Ponies Figurines | One Price Low Flat Shipping! From the GuitarMania collection, Eagle Eye. Made of hand-painted resin. Measures 10" tall. Comes with guitar stand, packaged in plush black guitar-shaped case. 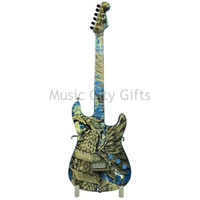 This guitar figurine features a blue background with an eagle painted over it. Has official Fender licensing logo on it.